Instrumentation: Granpa (speaker/singer,medium voice). young girl (speaker/singer). SATB(soloists), children's chorus, animal sounds-dog,hippo etc. First Performance: Recording at Sony's Whitfield Street Studios 1988 with Peter Ustinov(Granpa), Sarah Brightman(sop), Emily Osborne (girl), Wroughton Middle School Choir (winners of BBC Choir of the Year), London Voices, and the Sinfonia of London conducted by Howard Blake. Film drawn and directed by Diane Jackson, produced by John Coates - the creators of 'The Snowman', based on the book by John Burningham. The film won the Prix Jeunesse International award for excellence in children's television programming in 1990. The film review site Rotten Tomatoes has called the film "a sensitive and life-affirming animated adaptation". The film has rarely been repeated, nor released on DVD, perhaps due to its subject matter. The "Toonhound" review suggest that the film takes the tone of the ending of The Snowman even further, "exploring an aspect of life rarely approached in animated form." Composer's note: 'Channel 4 regarded 'The Snowman' as a great success and Clare Kitson their director of animation began discussing possible similar projects with John Coates the TVC producer of the film quite soon afterwards. Sometime in 1984 John approached Diane Jackson and myself with the idea of 'Granpa', another children's picture book, but this time by author John Burningham. It is a story of a little girl of perhaps seven called Emily and her aging gradfather and initially Diane and I were not enthusiastic because at the end the grandfather's chair is suddenly empty- he has died. Welcome Spring and the year that is starting. Channel 4 were talking about another film with nothing except music, but when finally Diane and I agreed to undertake it felt that it would work better as a kind of opera, with words taking the action forward, sung by Emily and Granpa and a a children's choir, not to mention a whale, a dog and some hippos! 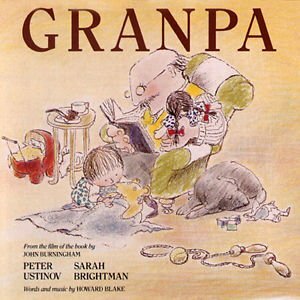 Wikepedia says: Granpa is a 1989 English family-oriented animated film, based on a 1984 children's illustrated story book by John Burningham. The film initially appeared on Channel 4 Television and was later released on VHS by Universal Studios. Directed by Dianne Jackson, who had previously adapted Raymond Briggs's The Snowman into an animated film, it is hand-illustrated with coloured pencil in imitation of the style of the original Burningham book. In common with The Snowman, the music is by Howard Blake, who also wrote the script for the film, which is referred to as an "animated children's opera". The voices of Granpa and Emily are by Peter Ustinov and Emily Osborne respectively. An expensive film to produce, it won the Prix Jeunesse International award for excellence in children's television programming in 1990. Flowers bloom and the wind it is blowing. Flowers fade and the wind it is blowing. A superior animation of heartfelt emotion and grace. I watched this a little while ago for the first time in almost twenty years, and it was even more finely animated and moving than I had remembered. To start with, I love all the daydream imagination sequences that begin whenever Granpa starts to tell Emily the stories, they're all so different, and are all so fun and wonderful to watch. And the powerful yet whimsical use of the grand operatic music scores are so engaging and make each of the tale segments very different from each other. It's really clever and fantastic how they're portrayed, you never exactly know where the imagination of the little girl ends and fantasy begins... I think they brilliantly captured just how the imagination works when you're at the tender age where you believe with all your heart the sweet fables loved ones tell you, and she just hangs on his every word. I still remember the feeling of when I was little and my mother would read to me before I went to sleep, and you really do kind of visualise it that way! Amazing. My favourite daydream is the one with the whale named Monstro because it's so thrilling and hilarious! I thought that a better choice than the jungle one for the final tale would have been the one with the dragon and the knights, seeing as it already had a strong sense of slowing and winding down to it that was much more fitting. I think it's just plain tragic how little known this is. My guess is that the extremely deep and somber themes it contains perhaps render it a little unpalatable for most folks. It's easily the equal of both the Snowman and Father Christmas animations. Although the Snowman has a very well deserved place etched in many people's hearts and their joy of the Christmas spirit, I think Granpa surpasses it greatly in terms of emotional impact and themes of mortality, and more than deserves the kind of glory and praise that classic has received. I think the emotions in this are more real and relatable because they have a far deeper resonance within the human soul. This short film has a special kind of fragile beauty and joy to it. The subtle build up, and the way everything culminates in the final scene is perfectly done. It just gets right to the heart of the matter and immediately tugs at the heart strings, with the little girl's confusion, the terribly lonely empty chair, and the old dog that outlives his master. Although I did vaguely remember it from before, I am not at all ashamed to say that the ending completely broke me down, and I don't cry as a rule, but I certainly did that time. It actually felt good, I was honoured that such a fine animation could have the power to move me so much. I don't believe I could ever see that ending without feeling the temptation to weep. The sadness is that of loss, but to me it's also a profound and beautiful kind of sadness-everything must eventually pass and fade, it is the way of things... And in those masterful final scenes I don't think that's his spirit that you're seeing, you just see the ghost of what he was when he was most happy and free as a boy in his own childhood, echoed in his beloved granddaughter as she runs through wild fields where the wind blows... In my opinion, this film is nothing short of a little masterpiece. It's powerful, bittersweet and perhaps even painful song will stay with you for a long time...cherish it. Granpa, based on the children's book by John Burningham, is the second (and sadly last) animation to be directed by the late Dianne Jackson. She will be forever remembered for the legendary Christmas animation The Snowman, from the book by Raymond Briggs. But she went on to direct Granpa in 1989 and then to do the initial planning and storyboarding for Father Christmas in 1991. Father Christmas would have been her second Raymond Briggs adaptation as director, but ill health meant that she had to hand over the director's reins to one of her protégés, Dave Unwin, who had worked with her as an animator on Granpa. She died tragically young in 1992, leaving Granpa as her final work as full director. Her concept for an animated series based on the works of Beatrix Potter, The World of Peter Rabbit and Friends, was completed by others and transmitted posthumously by BBC Television in 1993. Granpa is a beautiful and very British half hour animation about a little girl called Emily and her kindly but ailing old grandfather. Emily's developing personality, imagination and childhood memories are being formed by her days spent listening to Granpa's stories. The stories come to life in animated images brilliantly designed to look like a child's crayoned drawings. Vivid, bright and seemingly inherently childish, the images are actually highly sophisticated animations from director Jackson and her team of artists. Remember that all of these animated frames were created lovingly by hand in 1989, before computer generated imagery came to dominate the business of animation and rendered hand drawn, beautifully detailed cartoon films like Granpa obsolete! The tone of the film is initially warm and exhilarating, with Emily untroubled by notions of time or mortality. She lives fully within the moment, a child's viewpoint. For Granpa however, things are rather different. Aware that his days with her are numbered, he lovingly preserves her innocence and passes on to her a heritage within stories from his own distant childhood. As the seasons pass by (symbolically from spring to winter, and then to spring once more), Granpa becomes visibly frailer until finally, during a magical story that has the pair swinging through jungle branches, he concedes that "I just can't reach those branches...the way I used to be able to." In a heartbreaking coda that echoes the famous finale of The Snowman, Emily finds herself (along with the old man's sad, loyal old dog) to be alone; her young life before her and Granpa inevitably consigned to live on only in her memories. It's an astonishing finish, brave and sad and with an awareness of mortality and the sacredness of memory. In that sense, Granpa has much in common with all the great children's tales (Watership Down, Peter Pan, The Wind in the Willows, The Once and Future King, The Snowman, and many others), and in its so very British way it subtly and with great understatement covers the most serious themes of life, death, time and the rites of passage between old and new. A great piece of work, deserving of so very much more attention than it has received over the years. A neglected masterpiece that hardly ever gets screened, I recommend Granpa unreservedly. If you get the opportunity to watch this beautiful rarity, do so!